Mazel tov to TJP columnist and new great-grandmother Harriet Gross on the birth of her great-grandson Alexander James Wilson, son of Mollie and Brett Wilson. Alexander was born on June 15 at Magee-Women’s Hospital in Pittsburgh where he weighed in at 7 lbs. and measured 21 inches long. Grandparent honors are shared by Harriet’s son Sol B. Marcus, Marjorie Eisner McKee and Dawn and Scott Wilson all of Pittsburgh. Joining Harriet in the great-grandmother department is Ruth Ann Eisner also of Pittsburgh. Harriet tells the TJP that Alexander, whose Hebrew name is Aryeh Yehoshua, is named in loving memory of his great-grandfather Dr. Robert Eisner. Israel Bonds held a special summer board meeting on Monday, July 18 featuring distinguished guest, Stuart Garawitz, the national campaign director of Israel Bonds. Coming from New York, Stuart spoke of his vision for Israel Bonds going forward and the need to market Israel Bonds to the next generation. There was a record turnout for a summer meeting, which was convened at the home of Sherry and Kenny Goldberg. The meeting was led by Charles Pulman, Dallas/Fort Worth chair for Israel Bonds, and Nate Levine, Southwest regional chair of Israel Bonds. Volunteers of the Jewish War Veterans Auxiliary of the Dr. Harvey J. Bloom Post #256 recently visited the Veterans Hospital and the Fisher House, at the Dallas VA campus, to deliver their annual awards. These volunteers included: President LuAnn Bergman, Diane Benjamin, Ruth Swaab, Fran Bergman, Jo Reingold, Marcy Kramer-Kahn, Ellen Fiebel, Jean Garmon and Lonna Rae Silverman. The Fisher House, founded by philanthropists Zachary and Elizabeth Fisher, affords visiting family members of VA hospitalized veterans, on-site, convenient and gracious accommodations during their stay in Dallas. The JWVA once again, was able to make a generous contribution to this facility in a meaningful way, a gift of stuffed animals was given at the Fisher House, and a notebook computer and three portable DVD players were given to the hospice patients. The annual Grant A Wish program that the JWVA is able to support, this year was granted to hospice patients who made special requests that the JWVA was thrilled to fulfill. The JWVA is an assist to the Dr. Harvey J. Bloom Post #256. The Auxiliary holds monthly meetings wherein the focus is to plan stimulating programs to secure funds for the VA. These active and dedicated volunteers support the semi-annual Poppy Drives; help serve Thanksgiving dinners to the homeless veterans; partake in the recreation activities such as calling the Bingo games at the VA hospital on a regular basis; participate at national conventions by sending its delegates and hosting visiting national JWVA leaders; support to the National Museum of American Jewish Military History in Washington, D.C.; host Chanukah and other holiday events; and engender a strong camaraderie among it’s members who all share in their many deeds of loving kindness for the United States veterans. If you are related to a United States military serviceman, the JWVA welcomes your support and membership opportunity! Please contact LuAnn Bergman at 214-320-3712. The Temple Emanu-El Couples Club will have a catered dinner and evening of entertainment on Sunday Aug. 21, in its Tobian Auditorium. The highlight of the evening will be “A Night with Elvis,” with the return of “The King” performed by the famous Johnny Rocket, a highly talented impersonator and singer who has toured and presented this popular show for many years. The Temple Emanu-El Couples Club, founded 22 years ago, is a social club open to Temple members as well as any other Jewish couples of the community. One member of the couple should be 55 years of age or older. If interested in joining, call Frances Sue or Morton Schneider 972-398-1771, or Sarah Yarrin or Jack Repp 214-361-0486. Keith Barany, a comedian and writer with a resume ranging from the “Seinfeld” show to USO tours, will be the special guest at the Congregation Beth Torah Men’s Club kickoff Sunday brunch on Aug. 21. Barany, a frequent headliner in Las Vegas and praised by the New York Post as “the wittiest comedian working today,” will be on a Texas tour. Tickets are $10, $5 for students, and include the traditional lox-and-bagel buffet that has long been a Men’s Club trademark. The event begins at noon. As a comedy writer, Barany has contributed to “Seinfeld,” “Politically Incorrect,” “Jimmy Kimmel Live!” and the Emmy Awards show. He has taken his standup act overseas to entertain American troops five times, appeared at clubs in Las Vegas and throughout the country, and co-starred with Bob Hope, Jerry Seinfeld, Ray Romano, Ray Charles and Lewis Black. Beth Torah is located at 720 West Lookout Drive in Richardson. As always, the Men’s Club event is open to the entire community. For more information, call the synagogue at 972-234-1542. Elizabeth Mason has been named home health administrator of The Legacy at Home, a licensed home health agency offering skilled and private duty home health services. The healthcare agency will undergo CHAP accreditation and become certified by Medicare, in preparation for their launch this fall. “We are thrilled to announce The Legacy at Home and even more excited that Elizabeth will lead the operation,” said Michael Ellentuck, president of The Legacy Senior Communities, Inc.
Mason, a healthcare nurse manager, has more than 17 years of leadership in home health operations. She joins The Legacy from Outreach Health Services where she served as Medicare administrator for the North Central Texas region. Previously, she served NurseCore Management Services as regional vice president and also as director of clinical operations. A graduate of Northeastern Oklahoma State University, Mason was the regional director of clinical services for HealthForce Corporate office. She also served as a public health nurse for the Oklahoma State Department of Health Children First Program. The Legacy Senior Communities, Inc. is the parent company of The Legacy at Willow Bend and The Legacy at Preston Hollow. The senior art class at the J spends two hours a week working on their projects. 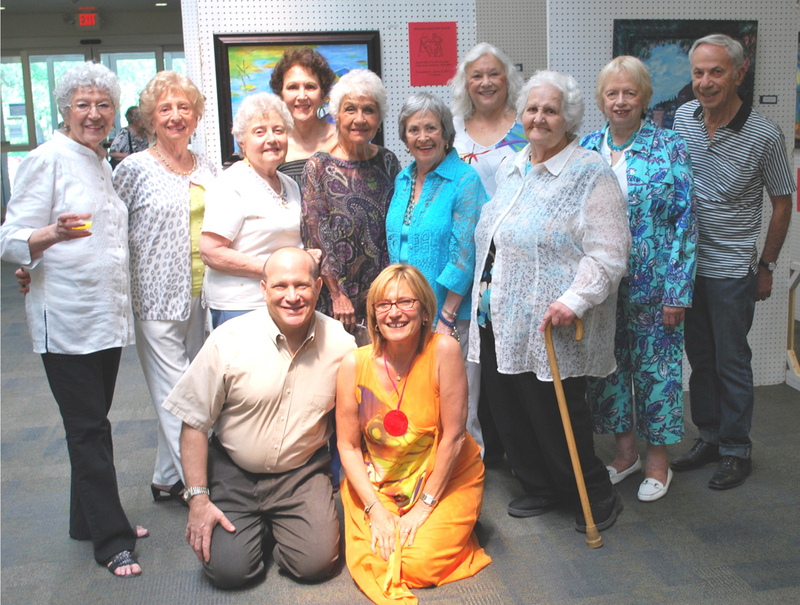 Shown here are from left, Muriel Miller, Pauline Helfand, Clarice Post, Tilly Prengler, Anita Holtzman, Sylvia Greenberg, Jane Guzman, Ilaya Potash, Rachel Frank and Gilbert Cohen. Sitting are JCC President Artie Allen and Veronique Jonas. Recently, Veronique Jonas, local artist extraordinaire shared some thoughts about the senior art class at the JCC with the TJP. “I have been teaching this class for the past eight years. It has been a wonderful and inspiring experience, for me and for students in this class. “Some of the students are veteran painters, and some had never painted before coming to the class. “Whether experienced or not, each one of our artists is gifted, creative and enthusiastic about their art. Their work is an inspiration to me, and very often to each other. “Each student rejoices in the accomplishments of the others. And each one’s work is different and unique, and yet a sense of camaraderie constantly exudes from this wonderful group of very young seniors. “The two hours spent with them weekly are a special gift that I will always cherish,” she said. We’d love to hear your news! Tell us about your vacation, awards or upcoming events. Send your news to sharonw@texasjewishpost.com or to the TJP office at 7920 Beltline Rd. Ste 680, Dallas, TX 75254.